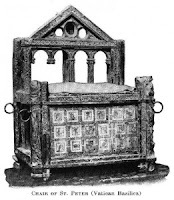 Today, February 22nd is the Feast of the Chair of Peter. We are not literally celebrating a piece of furniture. 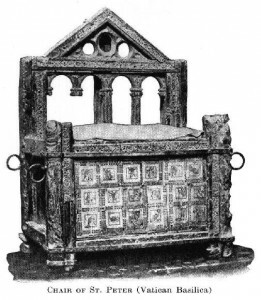 The chair in this case means the office or authority of Peter the first Pope. The feast was originally on January 18 to commemorate when Peter celebrated liturgy with the people of the see of Rome for the first time (Martyrologium Hieronymianum). The photo on the left is the actual chair which Peter used to preside over liturgies and from which he exercised his teaching authority. Alexander VII had it encased in bronze in order to preserve it. It is supported by statues of four great doctors of the Church: Ambrose, Augustine, Athanasius, Chrysostom. This chair can be traced to Peter and its authenticity can be confirmed by documentation and other evidence. The chair had gone through minor changes in order to maintain it and ornate it a bit. This is how the chair looks without the bronze encasement. This feast day is important in the Church because it is a reminder of the authority and primacy Peter had and which has been passed on via apostolic succession in the Papacy. 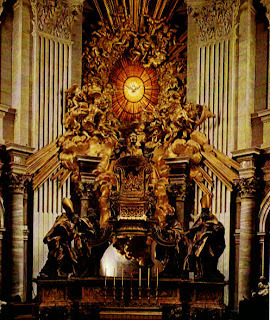 The chair is a symbol of the Petrine ministry. 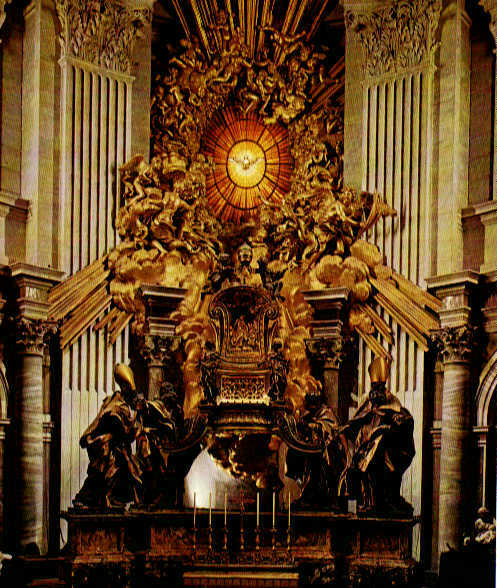 While Popes no longer use it in order to preserve it as an artifact of history and as a relic, the chair is displayed in great glory in the Basilica of St. Peter as a reminder of the authority of the Papacy. Protestants and Eastern Orthodox Christians often have issue with the Papacy. The Orthodox Christians feel that the Pope is a regular bishop and does not have any unique authority over the entire Church. Protestants feel the Pope is unnecessary and some even go as far as claiming that he is the anti-Christ. These charges are far from the truth. The Papacy is not something the Catholic Church invented. It was Jesus' idea. The Rock - No not the WWE Wrestler! The changing of one's name shows a promotion of status. For example Abram becomes Abraham (Genesis 17:5). Jesus did this to show that Peter was to be His representative or vicar on Earth. This is why the Pope is the "Vicar of Christ." He does not replace Jesus as if Jesus resigned or was a failure, rather, he stands in for Jesus as the visible head of the Church and chief shepherd. In Matt. 17:24-25 tax collectors approach Peter asking him if Jesus pays taxes. Peter here is demonstrated as the representative of Christ, or the Vicar of Christ. Some claim that the Greek word "petra" means pebble and not rock; however, the New Testament was written in Koine Greek and the word "petra" and "petros" means simply 'rock.' All scholars agree with this. Had Jesus wanted to call Simon "small rock or pebble," the appropriate word would have been "lithos." To further give more evidence to what Jesus actually meant, we must remember that Jesus did not speak Greek. He spoke Aramaic. The word Jesus actually used in his native tongue was, "Kepha" which means 'rock.' 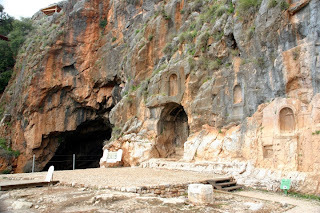 Peter is the rock upon which Christ built His Holy Catholic Church. To my knoweldge, there exists no Bible - with the exception of the Watchtower that alters texts - that states, "You are Peter and on this small stone/pebble I will build my Church." This is a clear indication that the use of the word "rock" was intentional. Keys are an important tool in human society. They can lock and unlock things. Keys are also a sign of possession or ownership. If I have the keys to a house, car, motorcycle or bank vault; I control them - I own them. As long as I hold the keys and no one else does, I have absolute authority. Jesus gives Peter the keys of the kingdom of Heaven, what does this mean? Is Jesus going on vacation and is giving the keys to his place to a mortal? No, not at all. Jesus as a descendant of King David is imitating the gesture of King Hezekiah in Isaiah 22:20-22. Hezekiah gives the keys to the kingdom of the House of David to his servant Eliakim. 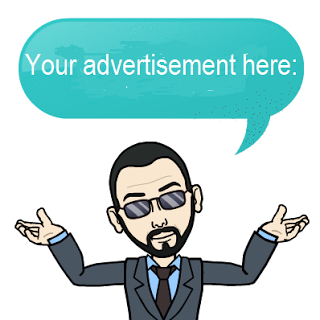 In the Jewish biblical tradition, this gesture grants royal dynastic authority and shows succession as the leader or prime minister of the House of David. By giving Peter the keys to His kingdom, Christ is giving Peter the authority to represent Him and the authority to change things or leave them as is. The key is also referred to in Revelations 3:7. This is further evidence that Jesus was in fact doing the same as Hezekiah. While Peter was indeed an Apostles just like the other 11, he still had a unique role. In the New Testament, Peter is mentioned by himself 155 times as opposed to the other Apostles who are mentioned together 130 times. Peter is mentioned first in the New Testament (Matt. 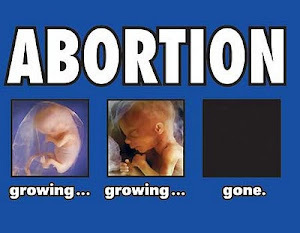 10:2; Mark 1:36; 3:16; Luke 6:14-16; Acts 2:37; 5:29). Coincidence? Not at all. It is human custom to name the most important person in a group first. This custom is still used today in the 21st century. We will always announce a President, Queen or King, Principal, or University President first before others. 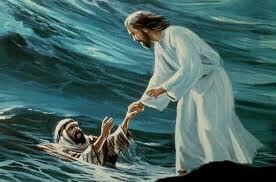 Peter was the only Apostle invited by Jesus to "walk on water," literally (Matt. 14:28-29) This shows that Jesus had a particular plan for Him in mind and was preparing him by giving him a lesson on what it means to be faithful even when one is surrounded by turbulent waters and wind. As the leader of the Church, Peter and his successors must be strong in faith even if it means contradicting the world. The world would say not to walk on water because you will sink and drown; however, if God says to do it, even if it makes no sense, we have to do it! In John 21:15-17, Jesus specifically commands Peter to feed his sheep and lambs. He asks Peter if he loves Him three times and then commands three times to feed his sheep and lambs. This was a foreshadowing of the three times Peter would deny Him (John 18:15-18) This also shows that no matter how weak Peter was, this did not take away from his authority or validity as Pope. Despite being called "Holy Father," the Pope is still a sinner and subject to personal failings. Nevertheless, his office remains firm and valid despite the failings of the man holding it. Peter was also a direct target of Satan. In Luke 22:31-32 Jesus tells Peter that Satan wanted to sift him up like wheat. This shows that Satan was aware of the importance of Peter and wanted to strike at him directly. The evidence from Scripture alone is overwhelming in regards to the primacy of St. Peter. It is obvious that Peter had a significant role as Pope in the first century up to his death whereupon St. Linus took over the Papacy. No academic or historian denies this historical truth. Recently on Facebook I had an interesting discussion regarding the Papacy. The rhetoric posted on the group obviously stems from the Anti-Catholicism during the post-Reformation era. This rhetoric is frowned upon by academia and is just based on prejudice and Protestant eisegesis. The Eastern Orthodox Church has issue with the Papacy mainly because of authority. This is sad indeed because we are not in the Church to obtain status or power. 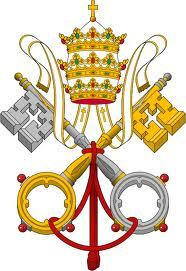 Yes the Pope is a bishop just like the bishop of New York, Boston, Puerto Rico, Madrid or Los Angeles; however, he has a unique role as the successor of Peter. The Pope is the leader of the Church and keeps the Church united. 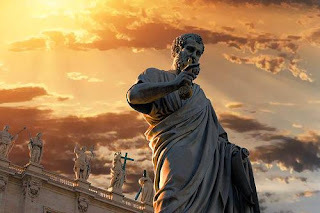 There is no valid reason based on Scripture, Tradition and History for anyone to not accept the authority of the Papacy as it is defined or the primacy of St. Peter. O God, the Shepherd and Ruler of all Your faithful people, mercifully look upon Your servant [name of Pope], whom You have chosen as the chief Shepherd to preside over Your Church. We beg You to help him edify, both by word and example, those over whom he has charge, that he may reach everlasting life together with the flock entrusted to him. Through Christ our Lord. Amen. 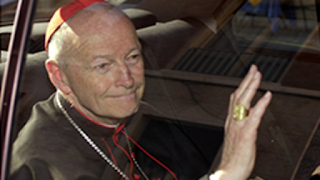 You oversimplify the objections to the primacy of the Bishop of Rome. Well they are a "whole lot about nothing" really when you closely examine them. No one had issue with the Papacy until the schism. Luther further exaggerated the issue with his Sola Scriptura fallacy which ended up creating the mess Christianity has now.